It's time to bring my journey through my favourite singles of 2006 to an end. Compared to 2005 (or, as it became known in my house, "the year of change"), 2006 was a pretty uneventful year in terms of major life events. Besides welcoming a dog into the family, things stayed pretty much as they were throughout the year. There were no shortage of hit singles from Kelly Clarkson's Breakaway album - in fact, there could have been more since there were plenty of quality album tracks. But, I was a couple of years away from including non-singles on my charts, and so "Walk Away" became the fifth and final song to feature. At the time, it seemed Kelly could do no wrong - but a year and a bit later, that would all change. Although they were still regularly scoring number 1s in the UK - as they did with this cheery single and its predecessor, "Please, Please/Don't Stop Me Now" (number 10 on this list) - McFly were increasingly preaching to the choir. Their chart-toppers would quickly plummet down the UK rankings once their loyal but limited fanbase snapped them up. A third short-lived hit came in 2006 from another double A-side, "Sorry's Not Good Enough/Friday Night" (number 83 on this list). Possibly 2006's most intriguing new band was Panic! At The Disco - with everything from that exclamation mark in their name to their verbose lyrics and oddball styling contributing to distinguish them from anyone else on the scene. Then there were the lengthy song titles - and for brevity's sake, I'll just say that as well as registering here with their biggest hit for the year, they also held down numbers 36, 99 and 116 on my year-end chart. Signed by Fall Out Boy's Pete Wentz, the group were part of a wave of post-pop/punk bands that I quite liked. The fourth and final single from Charlotte's Tissues And Issues album was a return to the rousing pop of earlier singles after the brief departure into ballad territory with "Even God". Despite the success of Charlotte's first full foray into mainstream music, it would be another four years before her next pop album, during which time she hosted a talk show and had two children with her then-boyfriend, rugby union player Gavin Henson. Things seemed to be going swimmingly for young Joanna Levesque, with this lead single from her second album returning her to the Australian top 10 and providing her with her first US top 10 hit - but that's where the good times ended. The follow-up to "Too Little Too Late" had the icky title "How To Touch A Girl" and after it flopped, JoJo became embroiled in seemingly endless legal disputes with her record label, resulting in no further hits to date. 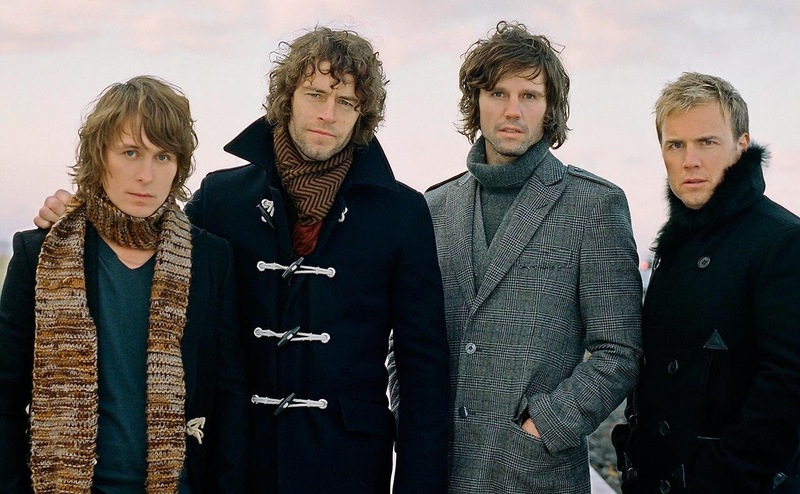 They'd been steadily gaining momentum the previous couple of years, and in 2006, Razorlight released their biggest and best singles to date with tracks taken from their self-titled second album. Lead single "In The Morning" was my favourite, but follow-up "America" (number 26 on this list) was even more successful, giving them their sole UK number 1. They were followed by third single "Before I Fall To Pieces" (number 47 on this list). I wasn't the only one late to the AFI party, with it taking until their seventh album, Decemberundeground, for the band to enjoy a major Australian or US hit in the form of "Miss Murder" (number 33 on this list). No doubt, the fact that a pop fan like me had come to enjoy not only that song but follow-up "Love Like Winter" would've caused their die-hard fans to despair, but in a world where Panic! At The Disco, Fall Out Boy and The Killers were the new pop acts, AFI and their big choruses fit right in. Talk about a career shift. At the start of the decade, Nelly became famous thanks to her earthy, almost folky singles like "I'm Like A Bird" and "Turn Off The Light", which served as an antidote to the pure pop of the Britneys and Christinas of the world. Then, after the relatively disappointing performance of second album Folklore, she fully embraced R&B and hip-hop, working with Timbaland on third album Loose, which yielded global hits like "Maneater", "Promiscuous" (number 39 on this list) and "Say It Right" (number 69). The change in direction was a massive success - with Loose going on to be the Canadian singer's highest-selling album to date. Averaging one killer single per year, Ashlee was quickly surpassing big sis Jess in my estimations - and even landed herself a music star boyfriend in the form of Fall Out Boy bassist Pete Wentz in 2006 to complete her pop princess persona. With Busted having, er, com-busted in 2005, the three former members moved on to new musical projects - Charlie Simpson in Fightstar, James Bourne in Son Of Dork, and Matt Willis as a solo artist and reality show contestant (he won the 2006 season of I'm A Celebrity...Get Me Out Of Here!). While I'd never been a fan of Busted, I did quite like this debut single by Matt, who only released one album and recently joined James in supergroup McBusted. It'd been a decade since we'd last had a new album from Kim Wilde, who'd mostly been concerned with starting a family and pursuing an alternate career as a celebrity gardener - but in 2006 she was back. Well, in Germany, anyway. Signed to EMI there, Kim released Never Say Never, which combined new tracks with revised versions of some of her biggest hits, like lead single "You Came 2006" (number 76 on this list). Original track "Perfect Girl" followed as a single, which managed to feel like classic Kim while still sounding like it came from 2006. Here's another act that'd last featured on the UK charts in 1996, but unlike Kim Wilde, Take That were welcomed back to their home country and the UK top 40. And what a welcome it was. The appropriately titled "Patience" shot to number 1 - the boy band's ninth chart-topper - and stayed there for four weeks. The accompanying album, Beautiful World, easily became the biggest of their career, selling more than 2.8 million copies in the UK alone. Now that's what I call a comeback. Kim Wilde, Depeche Mode, Take That, Madonna, a-ha... was this really 2006? The Norwegian trio drafted in super-producer Max Martin to give the title track of their eighth album a poppier flavour. The result? The band's biggest global hit since 1988's "Stay On These Roads". It may have only peaked at number 24 on the ARIA chart, but this first single by the trio version of Sneaky Sound System (who'd added singer Connie Mitchell to the line-up in 2004 after being a duo since 2001) did not leave the top 100 for 73 weeks. Follow-up "Pictures" (number 63 on this list) was another long-lasting hit - only reaching number 19 but spending 35 weeks in the top 50, 61 in the top 100. Time for some Eurovision - and in one of the competition's greatest travesties, this entry by Belgian singer Kate Ryan didn't even get past the semi-final stage. Of course, it wouldn't have mattered if she'd made the final - no one had any chance against Finnish rockers Lordi that year. Back in Part 1, we saw how Jessica Simpson was dealing with her divorce. At the other end of the spectrum was this earnest ballad by former 98 Degrees member Nick Lachey. To hammer the point home that he took the whole thing rather seriously, his next single was "I Can't Hate You Anymore" (number 67 on this list). The approach worked, with "What's Left Of Me" going top 10 in Australia and the US - far and away the biggest hit of Nick's career. Incidentally, Nick released a version of Take That's "Patience" as a single in 2009. Poor Orson. Despite releasing one of 2006's best singles, the American rock band will always be remembered for achieving a UK number 1 single with the lowest weekly sales figure up until that point (just over 22,000 copies). And even though they won a BRIT Award the following year (for Best International Breakthrough Act), Orson was over and done with by the end of 2007. They'd been releasing catchy pop/rock tunes since the late '90s without ever getting higher than number 33 on the ARIA chart, but in 2006, Fremantle band Eskimo Joe changed all that with this title track from their third studio album. The song made the top 10, the album hit the top spot - and Eskimo Joe were suddenly everyone's favourite band. 31 FRIEND OR FOE t.A.T.u. 150 MY LOVE Justin Timberlake featuring T.I. Another year recapped, which only means one thing: 2007 is next. Watch out for my top 100 from that year towards the end of August. Otherwise, I'll see you each Wednesday for my look back at the ARIA singles chart from 25 years ago. Some great songs in there that I have forgotten about like: Patience by Take That, Jump - Madonna (her best song of the 00's), Call On Me - Janet feat. Nelly. These few I need to purchase on iTunes! One song that I absolutely loved from 2006 was 'Opportunities' by Pete Murray. I remember John Mayer partnered up with him on this live performance at the ARIAS. Jump is so under-rated! Really should have been much bigger.